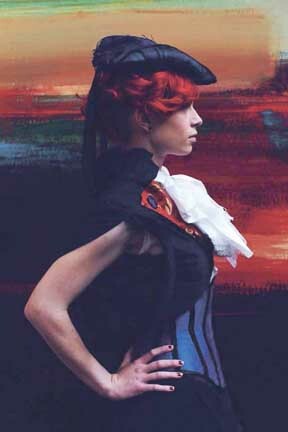 Some Steampunk fashion from Redfield Design. Steampunk fashion will be strutted across the runway when the Brass Ring Academy and Cabaret comes to the New England Carousel Museum on Jan. 9. And the organizer of the event—and one of the featured designers—is Kathryn Paterwic of Windsor, who is the driving force behind Redfield Design of Manchester. The participating businesses are, said Paterwic, As They Sew in France from Georgia and Pennsylvania, Voltaire Design from Massachusetts, Painter Production from Boston, Midnight Orchid from Pennsylvania, and Stitch Fairy from Connecticut. Pateric also said there are two personal designers Nightwing Whitehead and Sarah Murphy. “All of these designers all do full outfits but they are all very different views of Steampunk. Some don’t do Steampunk traditionally,” said Paterwic. “I am showing a line of Dieselpunk clothes,” said Paterwic. “While living in New England is good in some situations, you see a lot of the same people and make great friends but on the other side when you see the same people you see the same designers over and over again so it was super important to get more outside designers in and new blood with new views,” said Paterwic. The Brass Ring Academy and Cabaret will be held at the New England Carousel Museum, 95 Riverside Ave., Bristol on Saturday, Jan. 9. The Academy is open to all ages and doors open at 10 a.m. Classes start at 10:30 a.m. The event closes at 6 p.m. The Cabaret, which is open to ages 18 and up, starts at 7 p.m. and goes to 11:30 p.m. The Steampunk fashion show will be held at this time. Tickets for the academy are $20 for adults, $10 for ages 11 to 16, and free for children under 10 accompanied by a parent. The cabaret is $20. You can buy a $35 ticket for both the academy and cabaret. The MiniCon, a local media convention, will be held in Meriden on Saturday and Sunday. For more information, go to YourMinicon.com.